Dimensions: 10.8" x 9" x 4"
his is amazingly easy for a kid to use. Works especially well on carpet. Our five year old grandson calls himself a Legomaniac. 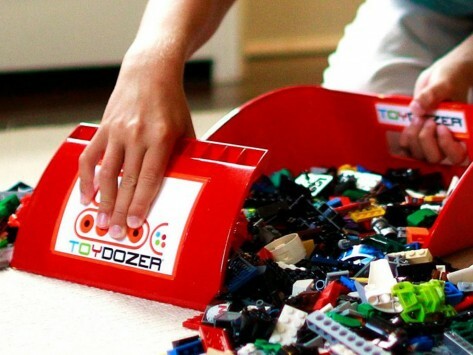 Toydozer makes clean up (several times a day) easy and fun. This is for a Christmas gift for my 2 grandsons for help in picking up Legos, Matchbox cars and trucks and "who knows what else", that usually ends up under the couch!! I am thinking of getting another one so the boys don't fight over using only one together. Has there ever been a kids' fuss about WANTING to be the one who picks up the toys??? Very nice company. I bought a few things and I loved them all. This is a timesaver extraordinaire. Pick up is no longer a chore or a bore; it’s a game and everyone wins with the Toydozer.